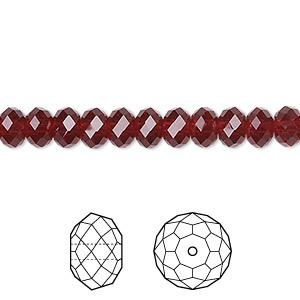 Bead, Swarovski® crystals, Siam, 6x4mm faceted rondelle (5040). Sold per pkg of 12. Item Number: H20-5031CY Have a question about this item? Swarovski crystal components are available in a rich multitude of rondelles. 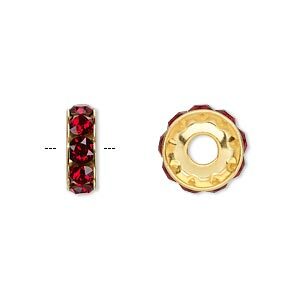 Perfect as spacers in necklaces or as discs in earrings. Rondelles can be used with many varieties of shapes or sizes. 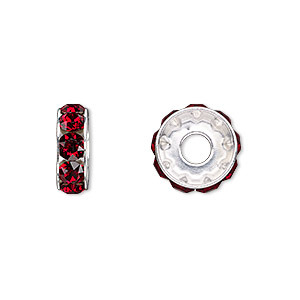 Use Swarovski crystal rondelles between large gemstones as accents with precious metal findings. Bead, Swarovski® crystals, Siam, 6x4mm faceted rondelle (5040). Sold per pkg of 144 (1 gross). 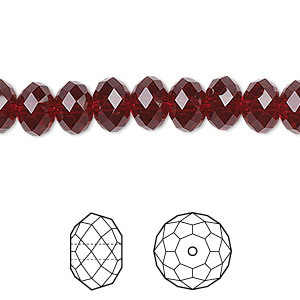 Bead, Swarovski® crystals, Siam, 6x4mm faceted rondelle (5040). Sold per pkg of 360.